Express Pull-N-Save is a self service used auto parts facility located in LaVergne, TN, just outside metropolitan Nashville. (ANNOUNCER)>> THERE'S NO DENYING IT, TUBE BUGGIES ROCK, BUT TO BUILD ONE YOU ALWAYS NEEDED A BENDER, NOTCHER, COLD SAW, AND MORE. 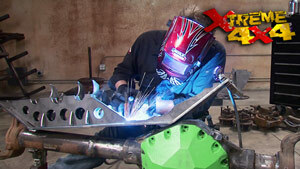 TODAY ON XTREME 4X4 WE PUT TOGETHER A PREBENT LASER CUT TUBE CHASSIS KIT USING A WELDER AND SOME HAND TOOLS. PLUS INSANE HILL CLIMB ACTION! (IAN)>> OUT OF ALL THE PROJECTS WE'VE BUILT HERE AT XTREME, PROBABLY ONE OF THE MOST POPULAR HAD NOTHING TO DO WITH THE VEHICLE. IT HAS TO DO WITH WHERE WE BUILT IT. IT'S WHEN WE TOOK THE SMALL SPACE UNDERNEATH OUR MEZZANINE AND DRESSED IT UP LIKE A TYPICAL TWO CAR GARAGE. FILLED IT WITH COMMON HAND TOOLS, AND BUILT A PRETTY COOL JEEP. WE FOCUSED ON USING A LOT OF READYMADE COMPONENTS, LIKE A CUSTOM FRAME FROM THROTTLE DOWN CUSTOMS AND AN ALL ALUMINUM JEEP BODY. USING AN OFF THE SHELF SUSPENSION SYSTEM. BUILT A COUPLE OF CUSTOM AXLES, AND IN THEN END HAD A REALLY GOOD DUAL PURPOSE JEEP THAT DID GREAT OUT ON THE TRAIL. NOW SINCE THEN, THIS PART OF OUR SHOP, WELL IT'S BECOME A SHOP AGAIN. WE'VE MOVED ALL THE FANCY EQUIPMENT BACK INTO IT. BUT CONSIDERING HOW MUCH YOU GUYS LIKE THAT WHOLE TWO CAR GARAGE THEME. WELL IT'S TIME TO CLEAN IT OUT AND DO IT AGAIN. BUT THIS TIME WE'RE NOT GONNA BUILD A JEEP. WE'RE NOT EVEN GONNA BUILD A BUDGET FRIENDLY CRAWLER. I CAN'T EVEN BUDGE IT. WE'RE GONNA BUILD A NO HOLDS BARRED, FULL THROW DOWN TUBE BUGGY BUILT TO CONQUER SOME SERIOUS HILLS. AND IN ORDER TO DO THAT IN A TWO CAR GARAGE, WELL WE HAD TO DO A LOT OF RESEARCH BECAUSE WE'RE GONNA PUT THIS RIG TOGETHER WITH ONLY TWO MAJOR PIECES OF EQUIPMENT, A WELDER AND A GRINDER. BUT IN ORDER TO BUILD A FULL TUBE CHASSIS WITH ONLY THOSE TWO TOOLS, WELL WE NEEDED SOMETHING PRETTY SPECIAL. SO WE FOUND A BUGGY IN THE BOX FROM DREW AT GOAT BUILT INC.
(DREW)>> BUYING A COMPLETE KIT, THEY CAN STILL BE INVOLVED WITH BUILDING IT AND THEY CAN STILL DO SOME CUSTOMIZATION, BUT THEY CAN SAVE SOME MONEY BY DOING THE ASSEMBLY AND LABOR THEMSELVES. (IAN)>> HE SPENT SOME SERIOUS TIME DESIGNING A CHASSIS THAT YOU PUT TOGETHER YOURSELF, PREBENT AND LASER NOTCHED, READY TO ASSEMBLE IN YOUR GARAGE AT HOME. HECK IT EVEN COMES WITH ITS OWN JIG. ALRIGHT SO THIS IS IT, RIGHT DREW? (DREW)>> THIS IS A BUGGY IN A BOX. (IAN)>> ALRIGHT, NOW WHICH ONE IS THIS? (DREW)>> THIS IS IBEX FOUR SEAT CHASSIS. (IAN)>> NOW WHAT'S THE DIFFERENCE BETWEEN FOUR SEAT AND TWO SEAT AND THE NUMBER OF TUBES? (DREW)>> THE MAIN DIFFERENCE IS THE BACK. SO THE BACK HAS A MORE SQUARED OFF LOOK SO IT FITS THE BACK SEATS. (IAN)>> OKAY, NOW YOU HAD ME GET SOME TUBING. I GOT SOME TWO BY FOUR CUT TO THE LENGTH YOU TOLD ME TO CUT IT AT. (DREW)>> YES, THAT'S FOR THE FIXTURE JIG. (IAN)>> AND THAT'S THE FIRST THING WE BUILD RIGHT? (IAN)>> ALRIGHT, SO THAT MEANS WE'RE GONNA BUILD A JIG. THE JIG CONSISTS OF FOUR PIECES OF TWO BY FOUR RECTANGULAR STRUCTURAL TUBING. AND ONCE YOU HAVE THEM ALL SET IN PLACE, MEASURE AND CHECK THAT THEY'RE SQUARE. OKAY, SO TRY THIS ONE. TACK THIS OR WELD THIS? BEEFY TACKS? THEN THE LASER CUT PIECES FROM GOAT BUILT WILL SIMPLY INDEX OFF OF THIS JIG. ONCE THEY'RE IN THE CORRECT POSITION WE'LL LOCK THEM IN PLACE WITH SOME SCRAP PIECES OF STEEL JUST TO MAKE SURE THEY DON'T BOW OR FLEX. THEN YOU CAN START ASSEMBLING YOUR TUBE CHASSIS. IT ALL BEGINS WITH THE FLOOR. THE PIECES SIMPLY FALL INTO THE SLOTS IN THE JIG, THE NOTCHES LINE UP, AND YOU CLAMP IT IN PLACE. IT EVEN COMES WITH BOLTS. THIS IS BETTER THAN IKEA. ALRIGHT DREW, THESE BOLT HOLES, THEY'RE DESIGNED TO JUST HOLD THIS TOGETHER BUT ALSO ALIGN IT RIGHT? (DREW)>> YES, IT'S A MITRE JOINT, SO IT CAN BE, YOU KNOW, IT'S GOT SOME ROOM TO SLIDE. SO IT ALIGNS THE CENTER LINES OF THE TUBES TOGETHER. IT ALSO GIVES YOU A GOOD PLACE TO MEASURE TO. (IAN)>> BECAUSE THIS IS THE FLOOR OF THE BUGGY? (DREW)>> THIS IS THE FLOOR. (IAN)>> AND BECAUSE THIS IS THE FIRST PART OF THE CHASSIS, WE'RE GONNA TAKE SOME TIME AND MAKE SURE IT'S PERFECTLY SQUARE. AND THEN WE CAN MOVE ON FROM THERE. OKAY, AND THEN THERE'S ALSO OTHER HOLES IN HERE TOO RIGHT? THERE'S LIKE LITTLE TINY, THE HOLES, WHAT ARE THOSE FOR? (DREW)>> THERE'S SOME SMALL ALIGNMENT HOLES. THEY'RE KIND OF LIKE THE SIZE OF THE TIP OF A PEN. YOU JUST LINE THE TUBE UP TO THE EDGE OF THE HOLE. YOU DON'T REALLY HAVE TO MEASURE MUCH. YOU CAN JUST BASICALLY LINE IT TO THE HOLE AND THAT'S WHERE IT GOES. (IAN)>> AND EACH ONE OF THESE TUBES, EACH ONE'S GOT A PART NUMBER ON IT RIGHT? (IAN)>> AND YOU LINE THOSE PART NUMBERS UP AT CERTAIN CORNERS? (DREW)>> YEAH, THE INSTRUCTIONS KINDA TELL YOU WHERE THE PART NUMBERS ARE ALIGNED TO SO YOU CAN GET THE TUBE IN THE RIGHT POSITION. TAKE YOUR TIME AND GET IT RIGHT, AND GET IT FLAT, AND THE REST IS A LOT EASIER. (IAN)>> I LIKE THAT WORD, EASIER! (DREW)>> THAT'S GOOD, JUST KIND OF SNUG. (IAN)>> SIX FOOT AND THREESIXTEENTHS, THAT'S EXACTLY THE SAME ISN'T IT? I THINK IT'S TIME FOR A WELDING HELMET. ALL THE TUBES ARE LOCKED TOGETHER WITH A SERIES OF FOUR BEEFY STRONG TACKS. THEN THE FLOOR IS FLIPPED OVER, ANOTHER PORTION OF THE JIG IS ASSEMBLED ON EITHER SIDE, AND YOU ASSEMBLE THE BOTTOM SIDE OF THE CHASSIS. (DREW)>> I DESIGNED IT ALL AND IT ALL WORKS CAD. SO EVERYTHING IS DESIGNED IN THREED, SO I KNOW EVERYTHING FITS. I KNOW EVERYTHING WORKS TOGETHER. IT'S AMERICAN MADE DOM TUBING. IT'S MOSTLY INCH AND THREE QUARTER 120 WALL. SOME OF IT'S INCH AND A HALF 120 WALL. YOU'RE LITERALLY JUST WELDING IT TOGETHER AND BOLTING ALL THE PARTS ON AND YOU'VE GOT A COMPLETE BUGGY. (ANNOUNCER)>> WITH THE FOUNDATION OF OUR CHASSIS IN PLACE, OUR BUGGY BUILD KICKS INTO OVERDRIVE. PLUS WE SEARCH THE SALVAGE YARD FOR OUR RIG'S ENGINE AND AXLES. (IAN)>> ALRIGHT DREW, WE'VE KNOCKED OUT A BUNCH OF THIS CHASSIS. WE'VE GOT THE FLOOR AND THE BOTTOM DONE, PASSENGER COMPARTMENT, AND NOW WE'RE GONNA WORK ON THE FRONT END. BUT ONE THING I'VE NOTICED, THIS IS DIFFERENT THAN A LOT OF THE OTHER BUGGIES WE GET IN HERE. THERE'S A LOT OF SQUARED OFF CORNERS. WAS THAT A PLAN IN THE DESIGN? (DREW)>> YES IT WAS. IT'S KIND OF A STRONGER DESIGN, SO YOU WANT ALL THE TUBES TO GO TOGETHER AT A NODE. AND ONCE THEY ALL GO TOGETHER AT ONE POINT, IT'S A LITTLE STRONGER. PLUS IT'S EASIER TO MAKE, AT LEAST FOR THIS CHASSIS, BECAUSE ALL THE TUBES ARE LASER CUT AND IT JUST FITS BETTER. (IAN)>> NOW ANYONE WHO'S SEEN ANY OFF ROAD RACE CARS BEING BUILT, THEY'RE BUILT VERY SIMILAR TO THIS RIGHT, NOT A LOT OF BENT TUBE? (DREW)>> YES, MOST OF THEM ARE. (IAN)>> BUT SITTING ON A JIG LIKE THIS IT KINDA STICKS OUT BECAUSE IT'S ALL YOU SEE IS JUST A SQUARE, BUT WHEN YOU'RE DONE IT'S MAINLY FOR STRENGTH. (DREW)>> YEAH, YOU HARDLY SEE THEM ONCE IT'S ALL TOGETHER, AND MOST OF THESE MITRE JOINTS, THERE'S SIX TUBES GOING TO THAT ONE POINT. SO IT'S REALLY STRONG. (IAN)>> PERFECT, SO WE FLIPPED THE BUGGY AROUND. WE'VE GOT THE FRONT END WITH THE FRONT JIG UP FRONT. NOW BASICALLY JUST PUT THE FRONT END THE SAME AS THE REST OF THE BUGGY. JUST MEASURE, TUBES, TUBES? (DREW)>> YEAH, THE FIXTURE JUST HOLDS THE FRONT TUBES, SO IT ALIGNS IT IN THE CORRECT POSITION AND HELPS YOU JUST HOLD IT SO YOU CAN PUT IT TOGETHER EASY. BUT JUST PUT THE FIXTURES TOGETHER AND PUT THE TUBES ON THERE, AND TAKE SOME MEASUREMENTS TO DOUBLE CHECK IT, AND IT GOES TOGETHER REALLY EASY. (IAN)>> THEN THE ENTIRE BUGGY IS TURNED AROUND ONE MORE TIME IN THE JIG, GETS LOCKED INTO PLACE, AND WE START ASSEMBLING THE BACK HALF OF THE CAR. (IAN)>> ALRIGHT DREW, WE'VE GOT THE CHASSIS BUILT BASICALLY TO THE BELT LINE AND WE HAVE THREE DISTINCT AREAS RIGHT? WE'VE GOT AN ENGINE COMPARTMENT, A PASSENGER COMPARTMENT, AND THEN BECAUSE OF THE FOUR SEATER, THIS IS A PASSENGER COMPARTMENT AS WELL RIGHT? (IAN)>> NOW WHAT IS THE DIFFERENCE BETWEEN THIS FOUR SEAT CHASSIS AND A TWO SEAT CHASSIS, WHERE DOES IT CHANGE? (DREW)>> THE FOUR SEATER HAS LIKE THE CAGE THAT GOES OVER THE REAR PASSENGER'S HEADS TO PROTECT THEM BUT THE TWO SEATER JUST KIND OF GOES STRAIGHT DOWN TO THE FRAME RAIL. AND THE FUEL CELL ON THE FOUR SEATER'S WAY IN THE BACK? (DREW)>> RIGHT, THE FUEL CELL GOES IN THE BACK ON THE FOUR SEAT, AND THEN WE JUST USE THE SAME ONE AND TURN IT AROUND AND PUT IT AGAINST THE FRONT SEATS FOR THE TWO SEATER. (IAN)>> SO ALL THAT'S LEFT NOW IS WE'RE GONNA BUILD THE CAGE AND THEN ADD JUST A BUNCH OF TUBES? (IAN)>> THE BARS OVER THE DRIVER AND THE PASSENGER MEET AT THE MIDDLE BPILLAR WITH A LARGE SLUG FOR EXTRA STRENGTH. THEN THE ROOF BARS AND THE WINDSHIELD BARS ARE DROPPED INTO PLACE TO FINISH UP THIS CHASSIS. ALL THAT'S LEFT TO DO IS SPEND SOME TIME FINISH WELDING THIS ENTIRE BUGGY. BUT BEFORE WE DO THAT I HAVE ONE MORE QUESTION FOR DREW. WHAT IS AN IBEX? (DREW)>> IBEX, IT'S A SPECIES OF GOAT, MOST AGGRESSIVE. IT LIVES IN THE MOUNTAINS AND IT'S KIND OF THE MEANEST, BADDEST, GOAT SPECIES. (IAN)>> SO IN A COUPLE OF DAYS IN YOUR TWO CAR GARAGE WITH JUST A WELDER AND A GRINDER YOU COULD HAVE THIS, A FULL TUBE BUGGY CHASSIS READY FOR THE DRIVETRAIN OF YOUR CHOICE. (ANNOUNCER)>> UP NEXT WE HUNT DOWN THE GOODS TO FILL UP OUR CHASSIS. PLUS HOW TO BUILD A BUGGY THAT CAN DO THIS. (IAN)>> ONE OF THE NICEST THINGS ABOUT THIS CHASSIS KIT THAT WE GOT FROM GOATBUILT IS THAT THEY'VE DONE A LOT OF THE HARD WORK FOR US. 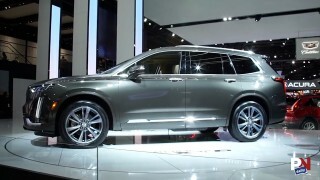 THE ENTIRE FRONT END IS DESIGNED TO FIT THE POPULAR GENERAL MOTORS GEN THREE, GEN FOUR SERIES OF ENGINES. THAT MEANS ALL WE HAVE TO DO IS GO OUT AND FIND AN LQ NINE SIX LITER, OR AN LM SEVEN FIVE POINT THREE AND IT WILL EASILY FIT INTO THE ENGINE BAY, AND MORE IMPORTANTLY, HE HAS THE ENGINE MOUNTS TO MAKE IT ATTACH TO THE CHASSIS. NOW SINCE THAT MOTOR WAS IN PRODUCTION FROM 1999 ALL THE WAY UP TO 2007, THERE'S GONNA MILLIONS OF THEM OUT THERE FOR US TO CHOOSE FROM. ALL WE HAVE TO DO IS GO FIND ONE. THAT MEANS ROAD TRIP! NOW THERE'S A LOT OF JUNKYARDS OUT THERE, BUT WE'RE LOOKING FOR A BUNCH OF DIFFERENT PARTS. WE'RE HEADED OVER TO OUR LOCAL SELF SERVICE YARD, EXPRESS PULL AND SAVE JUST OUTSIDE OF NASHVILLE, TENNESSEE. (JESSICA)>> WE HAVE ABOUT 1,400 CARS ON THE LOT. YOU COME OUT, I CAN TELL YOU WHERE WE HAVE A VEHICLE. THEN IT'S UP TO YOU. YOU CAN GO PULL ANYTHING AND EVERYTHING YOU WANT TO OFF OF THAT VEHICLE. (IAN)>> AND WITH ALL THOSE CARS AND TRUCKS TO CHOOSE FROM, WE'RE GONNA START BY JUST WALKING THROUGH THE YARD AND LOOK FOR SOME ODDS AND ENDS THAT WE CAN USE ON OUR BUGGY PROJECT. THAT'S TWIN ELECTRIC FANS, ABOUT 12 INCHES, THAT'D BE PERFECT FOR THE BUGGY. READY TO COME OUT. BY NOW I'M SURE YOU'VE FIGURED OUT I LOVE A GOOD 14 BOLT AXLE, AND WHEN I SPOT ONE IN THE YARD IT HAS TO BE MINE. THIS IS WHAT I'M LOOKING FOR, CHEVY, ONE TON PICK UP. IT'S TWO WHEEL DRIVE, BUT THAT'S OKAY CAUSE THE AXLE WE WANT IN THE BACK. 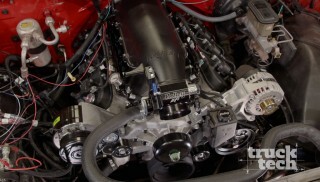 IT'S A 14 BOLT FULL FLOATER. NOW THE FULL FLOATERS ARE EASY TO SPOT. JUST LIKE THE OTHER ONE, IT'S GOT THE REMOVABLE AXLES, BUT THE DIFFERENCE IS IT'S GOT THE PINION SUPPORT THAT BOLTS ON TO THE FRONT, AND IT'S A DUALLY, WHICH MEANS IT'S GOT THE BIG AXLE TUBE. NOW IT'S MY JOB TO TAKE IT OUT. TO MAKE THIS JOB A LOT EASIER, I BROUGHT ALONG OUR BRAND NEW MATCO BATTERY OPERATED FOUR AND A HALF INCH GRINDER. BY INSTALLING A CUTTING DISC ONTO IT, WE CAN SIMPLY SLICE THROUGH ALMOST EVERY PART TO GET THIS AXLE ONTO THE GROUND. AND SINCE THE FULL SERVICE YARD IS RIGHT NEXT DOOR, WE'RE NOT LIMITED TO JUST THE PARTS WE'RE GONNA PULL OFF THE WRECKED CARS. THEY'VE GOT TONS OF NEWER CARS AND TRUCKS THAT THEY DISMANTLE AND CATALOG FOR YOU TO PURCHASE. (JESSICA)>> SO YOU CAN COME IN AND SAY I NEED A RIGHT FRONT FENDER, AND I WANT IT TO BE RED FOR AN '06 CAVALIER, AND THEY'RE GONNA BE ABLE TO TELL YOU IF THEY HAVE IT ON THE SHELF. IF THEY DO THEY'RE GONNA WALK RIGHT UP TO YOU AND HAND IT TO YOU. (IAN)>> THEY FOUND US A GOOD, LOW MILEAGE FIVE POINT THREE AND A DANA 50 FORD SUPER DUTY FRONT AXLE THAT'LL BECOME OUR NEW CUSTOM FRONT AXLE. AND THE BEST PART ABOUT IT IS ALL THE PARTS THAT WE GOT TODAY, THE ONES THAT WE PULLED OURSELVES AND THE ONES THEY PULLED FOR US, ALL COME WITH A GOOD WARRANTY. (JESSICA)>> EVERYTHING WE SELL HAS A 30 DAY WARRANTY, WITH THE EXCEPTION OF TIRES. YOU CAN BRING IT IN, EXCHANGE IT, WE CAN GIVE YOU A STORE CREDIT TOWARDS THE PURCHASE OF SOMETHING ELSE. (IAN)>> SO IN ONE TRIP IN ONE AFTERNOON, WE WERE ABLE TO PICK UP BASICALLY THE ENTIRE DRIVETRAIN FOR OUR BUGGY ALL AT A REASONABLE PRICE. (ANNOUNCER)>> COMING UP, IN DEPTH INFO TO BUILD A BETTER HILL CLIMBER. (IAN)>> YOU KNOW, FOUR WHEELING HAS CHANGED A LOT. 20 SOMETHING ODD YEARS AGO, IF YOU HAD A SPRUNG OVER CJ, WELL YOU WERE A KING OF THE HILL. NOWADAYS YOU DON'T EVEN SEE RIGS LIKE THAT AT THE MALL. NOW NOT TOO LONG AGO IF YOU SAW A TUBE BUGGY LIKE THIS YOU'D THINK ONE THING, ROCK CRAWLER. WELL THAT'S CHANGED TOO. NOW GUYS BUILD MACHINES LIKE THIS, PUT MONSTER HORSEPOWER UNDERNEATH THE HOOD, AND PURPOSE BUILT DRIVETRAINS WITH ONE GOAL IN MIND. THE BEST WAY TO DESCRIBE IT IS HILL CLIMBING. THEY'RE KIND OF LIKE THE MONSTER TRUCKS OF THE OFF ROAD PARK. NOT THERE TO WIN A RACE, BUT THERE TO PUT ON A GREAT SHOW FOR EVERYONE WHO WATCHES. AND NOBODY DOES IT BETTER THAN TIMMY CAMERON. BUT HOW DOES HE PUT TOGETHER A RIG TO HANDLE THIS KIND OF ABUSE? WELL LETS TAKE A LOOK. IT STARTS WITH THE CHASSIS. NOW TO A LOT OF PEOPLE THERE'S JUST A BUNCH OF EXTRA TUBE IN HERE, BUT IT'S THERE FOR A REASON. BY USING SHORT RUNS OF TUBING WITH A LOT OF JOINTS, IT MAKES THE WHOLE PACKAGE A LOT STRONGER AND ABLE TO HANDLE SOME SERIOUS ROLL OVER. WHEEL SPEED IS KEY TO MAKING IT TO THE TOP, AND TO SPIN THESE CUT 43 INCH TALL SWAMPERS, THIS BUGGY'S GOT AN LSX 454 PUSHING JUST NORTH OF 600 HORSEPOWER. BEHIND THAT A POWER GLIDE WITH STRAIGHT CUT PLANETARIES FEEDS AN ATLAS TWO TRANSFER CASE WITH A THREE POINT EIGHT TO ONE LOW RANGE. CONNECTED TO THAT ARE TWO DRIVELINES WITH 1410 UJOINTS SPINNING SOME CUSTOM AXLES. AND AFTER TRYING A BUNCH OF DIFFERENT AXLE COMBINATIONS AND BREAKING MOST OF THEM, TO HANDLE THE ABUSE THIS BUGGY PUTS OUT TOOK A COUPLE OF DIFFERENT AXLE ASSEMBLIES. IT STARTS IN THE MIDDLE WITH A 14 BOLT CENTER SECTION. INSIDE THERE IS A SPOOL THAT'S BEEN BROACHED TO 40 SPLINE. THE OUTERS HAVE BEEN CUT OFF A ROCKWELL TWO AND A HALF TON TOP LOADER AXLE. THE TYPE OF AXLE YOU SEE IN LARGE MILITARY TRUCKS. 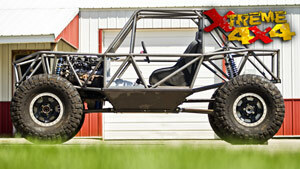 NOW THIS COMBINATION GIVES THE BUGGY GOOD GROUND CLEARANCE, LIGHT WEIGHT, AND EXCELLENT STRENGTH. THE SUSPENSION IS A DOUBLE TRIANGULATED FOUR LINK BOTH FRONT AND REAR WITH 7075 ALUMINUM LINKS AND INCH A QUARTER HEIMS, ALL RIDING ON FOX EMULSION COIL OVER SHOCKS. RECENTLY WE CAUGHT UP WITH TIMMY AND A BUNCH OF HILL CLIMBERS TAKING THEIR SHOTS AT A HUGE HILL IN ARKANSAS. A BUNCH OF GUYS TRIED, A FEW GOT AIR, SOME EVEN BROKE THEIR BUGGIES ALMOST IN HALF, BUT IN THE END THIS RIG WAS THE ONLY ONE THAT MADE IT TO THE TOP. FOR DETAILS ON ANY OF THE PRODUCTS SEEN IN TODAY'S EPISODE, HEAD ON OVER TO POWERBLOCK TV DOT COM.